The Protopalatial period of Minoan civilization (1900 to 1700 BCE) and the Neopalatial Period (1700 to 1450 BCE) saw the establishment of administrative centers on Crete and the apex of Minoan civilization, respectively. The Minoan civilization was named after the mythical King Minos, because the first excavator, Sir Arthur Evans , mistook the many rooms and corridors of the administrative palace of Knossos to be the labyrinth in which Minos kept the Minotaur. The Protopalatial period (1900–1700 BCE) saw the establishment of administrative centers on the island of Crete. The identifying features of Minoan civilization—extensive sea trade and the building of communal civic centers—are first seen on the island during this time. The Protopalatial period ended in 1700 BCE when the palaces of the island were destroyed and life on the island was significantly disrupted. The unknown cataclysmic event is believed to be either an earthquake or an invasion. During the Neopalatial period (1700–1450 BCE), the Minoans recovered from the cataclysm and reached the height of their civilization, eventually controlling the major trade routes in the Mediterranean. labyrinth: A maze, especially underground or covered. minotaur: A monster with the head of a bull and the body of a man. Linear A: A syllabary used to write the as-yet-undeciphered Minoan language, and an apparent predecessor to other scripts. The ancient sites on the island of Crete were first excavated in the early 1900s by the British archaeologist Sir Arthur Evans. Evans excavated the site of Knossos, where he discovered a palace. From this fact and related points, he decided to name the civilization after the mythical King Minos. The many rooms of the palace at Knossos were so oddly shaped and disordered to Evans that they reminded him of the labyrinth of the Minotaur. According to myth, Minos’ wife had an illicit union with a white bull, which lead to the birth of a half bull and half man, known as the Minotaur. King Minos had his court artist and inventor, Daedalus, build an inescapable labyrinth for the Minotaur to live in. Archaeological evidence dates the arrival of the earliest inhabitants of Crete in approximately 6000 BCE. Over the next four thousand years the inhabitants developed a civilization based on agriculture, trade, and production. The Minoan’s civilization on Crete existed during the Bronze Age , from 3000 to 1100 BCE , although the Mycenaeans from Greece invaded the island in the mid-1400s BCE and occupied it for the last centuries before the Greek Dark Age. The Minoans were known as great seafarers. They traded extensively throughout the Mediterranean region. Map of Minoan Crete: A map of Minoan Crete. The Protopalatial Period is considered the civilization’s second phase of development, lasting from 1900 to 1700 BCE. During this time the major sites on the island were developed, including the palatial sites of Knossos, Phaistos, and Kato Zakros, which were the first palaces or administrative centers built on Crete. These civic centers appear to denote the emergence of a collective community governing system, instead of system in which a king ruled over each town. During this period the Minoan trade network expanded into Egypt and the Near East; the first signs of writing, the still undeciphered language Linear A , appear. The period ended with a cataclysmic event, perhaps an earthquake or an invasion, which destroyed the palace centers. The Neopalatial period occurred from 1700 to 1450 BCE, during which time the Minoans saw the height of their civilization. Following the destruction of the first palaces in approximately 1700 BCE, the Minoans rebuilt these centers into the palaces that were first excavated by Sir Arthur Evans. During this period, Minoan trade increased and the Minoans were considered to rule the Mediterranean trading routes between Greece, Egypt, Anatolia , the Near East, and perhaps even Spain. The Minoans began to settle in colonies away from Crete, including on the islands of the Cyclades, Rhodes, and in Egypt. Minoan palace centers were divided into numerous zones for civic, storage, and production purposes; they also had a central, ceremonial courtyard. The palaces excavated on Crete functioned more as administrative centers with rooms for civic functions, storage, workshops, and shrines located around a central, ceremonial courtyard. The palaces have no fortification walls, suggesting a lack of enemies and conflict, although the natural surroundings provide a high level of protection, and the multitude of rooms creates a continuous, protective façade . Minoan columns were uniquely shaped, constructed from wood, and painted. They are tapered at the bottom, larger at the top, and fitted with a bulbous, pillow-like capital . The complex at Phaistos bears many similarities with its counterpart at Knossos, although it is smaller. Minoan builders rebuilt new complexes atop older ones in the aftermath of damaging earthquakes. pithoi: (Singular: pithos) Large storage jars for liquids—oil, wine, and water—and grains. fresco: A water-based painting applied to wet or dry plaster. capital: The topmost part of a column. The most well known and excavated architectural buildings of the Minoans were the administrative palace centers. When Sir Arthur Evans first excavated at Knossos, not only did he mistakenly believe he was looking at the legendary labyrinth of King Minos, he also thought he was excavating a palace. However, the small rooms and excavation of large pithoi , storage vessels , and archives led researchers to believe that these palaces were actually administrative centers. Even so, the name became ingrained, and these large, communal buildings across Crete are known as palaces. Although each one is unique, they share similar features and functions. The largest and oldest palace centers are at Knossos, Malia, Phaistos, and Kato Zakro. The complex at Knossos provides an example of the monumental architecture built by the Minoans. The most prominent feature on the plan is the palace’s large, central courtyard. This courtyard may have been the location of large ritual events, including bull leaping, and a similar courtyard is found in every Minoan palace center. 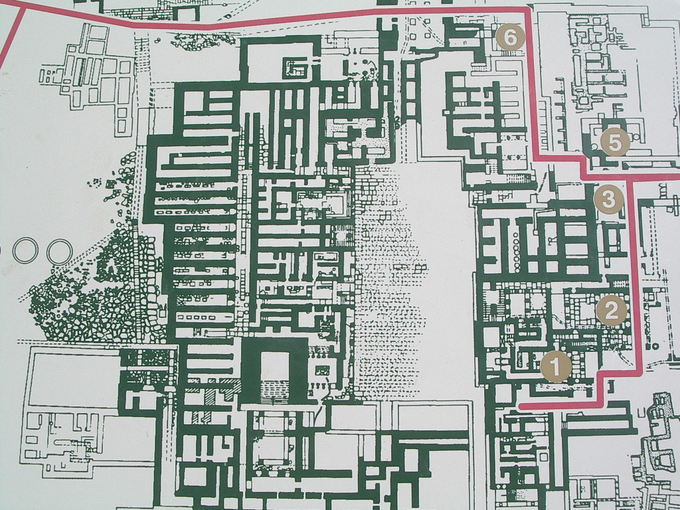 Plan of the palace at Knossos: An overview map of the palace at Knossos, Crete, Greece, circa 1700–1400 BCE. Several small tripartite shrines surround the courtyard. The numerous corridors and rooms of the palace center create multiple areas for storage, meeting rooms, shrines, and workshops. The absence of a central room and living chambers suggest the absence of a king and, instead, the presence and rule of a strong, centralized government. The palaces also have multiple entrances that often take long paths to reach the central courtyard or a set of rooms. There are no fortification walls, although the multitude of rooms creates a protective, continuous façade. While this provides some level of fortification, it also provides structural stability for earthquakes. Even without a wall, the rocky and mountainous landscape of Crete and its location as an island creates a high level of natural protection. Restored north portico: The rocky and mountainous landscape of Crete creates a high level of natural protection. The palaces are organized not only into zones along a horizontal plain, but also have multiple stories. Grand staircases, decorated with columns and frescos , connect to the upper levels of the palaces, only some parts of which survive today. Wells for light and air provide ventilation and light. The Minoans also created careful drainage systems and wells for collecting and storing water, as well as sanitation. Their architectural columns are uniquely constructed and easily identified as Minoan. They are constructed from wood, as opposed to stone, and are tapered at the bottom. They stood on stone bases and had large, bulbous tops, now known as cushion capitals. 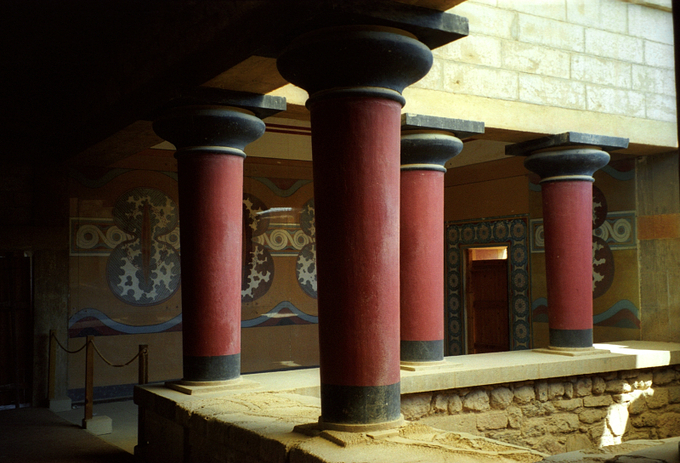 The Minoans painted their columns bright red and the capitals were often painted black. Restored interior stairwell: Palace at Knossos, Crete, Greece. Circa 1700–1400 BCE. Phaistos was inhabited from about 4000 BCE. A palatial complex, dating from the Middle Bronze Age , was destroyed by an earthquake during the Late Bronze Age. Knossos, along with other Minoan sites, was destroyed at that time. The palace was rebuilt toward the end of the Late Bronze Age. The first palace was built about 2000 BCE. This section is on a lower level than the west courtyard and has a nice facade with a plastic outer shape, a cobbled courtyard, and a tower ledge with a ramp that leads up to a higher level. The old palace was destroyed three times in a time period of about three centuries. After the first and second disaster, reconstruction and repairs were made, so there are three, identifiable construction phases. Around 1400 BCE, the invading Achaeans destroyed Phaistos, as well as Knossos. The palace appears to have been unused thereafter. The Old Palace was built in the Protopalatial period. When the palace was destroyed by earthquakes, new structures were built atop the old. In one of the three hills of the area, remains from the Neolithic era and the Early Minoan period have been found. Two additional palaces were built during the Middle and Late Minoan periods. The older one looks like the palace at Knossos, although the Phaistos complex is smaller. On its ruins (probably destroyed by an earthquake around 1600 BCE), the Late-Minoan builders constructed a larger palace had several rooms separated by columns. Like the complex at Knossos, the complex at Phaistos is arranged around a central courtyard and held grand staircases that led to areas believed to be a theater, ceremonial spaces , and official apartments. Materials such as gypsum and alabaster added to the luxurious appearance of the interior. View of the complex at Phaistos from the south: A view of the ruins of the complex at Phaistos. Minoan painting is distinguished by its vivid colors and curvilinear shapes that bring a liveliness and vitality to scenes. The fresco known as Bull Leaping, found in the palace of Knossos, is one of the seminal Minoan paintings. 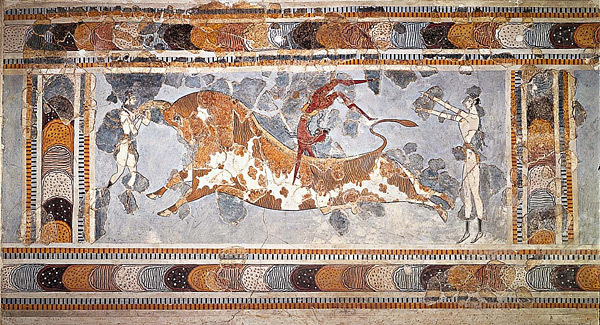 It depicts the Minoan culture ‘s fascination with the bull and the unique event of bull leaping—all painted in the distinctive Minoan style . The Minoan city of Akrotiri on the island of Thera was destroyed by a volcanic eruption that preserved the wall paintings in the town’s homes. One fresco, known as Flotilla, depicts a highly developed society. Kamares ware is pottery made from a fine clay. These vessels are painted with marine scenes and abstract flowers, shapes, and geometric lines . Marine-style vase painting depicts marine life and scenes with organic shapes that fill the entire surface of the pot, using a technique known as horror vacui . Unlike Kamares ware, Marine-style scenes are painted in dark colors on a light surface. horror vacui: Latin, meaning fear of empty space; this is also the name for a style of painting when the entire surface of a space is filled with patterns and figures. fresco:In painting, the technique of applying water-based pigment to plaster. buon fresco:A more durable mural painting technique in which alkaline resistant pigments, ground in water, are applied to plaster when it is still wet, as opposed to fresco-secco when the plaster has been allowed to dry and is remoistened. 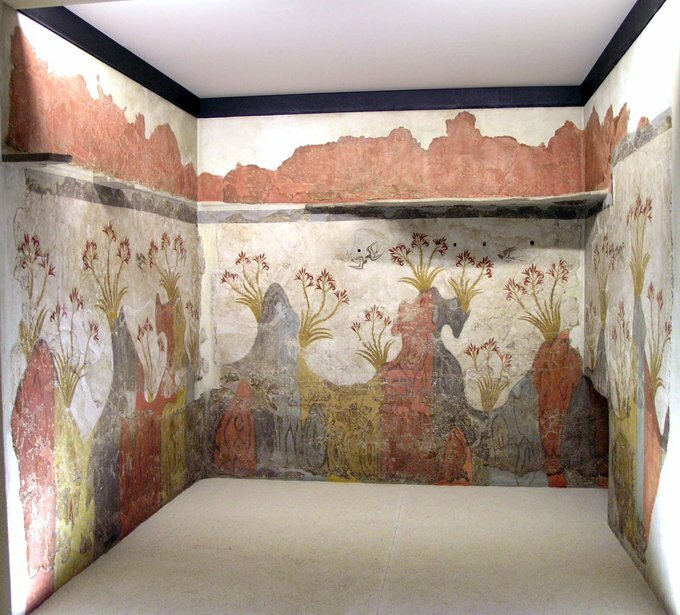 The Minoans decorated their palace complexes and homes with fresco wall paintings. Buon fresco is a form of painting where the pigment is painted onto a wet limestone plaster. When the plaster dries the painting also dries, becoming an integral part of the wall. In the Minoan variation, the stone walls are first covered with a mixture of mud and straw, then thinly coated with lime plaster, and lastly with layers of fine plaster. The Minoans had a distinct painting style with shapes formed by curvilinear lines that add a feeling of liveliness to the paintings. The Minoan color palette is based in earth tones of white, brown, red, and yellow. Black and vivid blue are also used. These color combinations create vivid and rich decoration. Because the Minoan alphabet, known as Linear A , has yet to be deciphered, scholars must rely on the culture’s visual art to provide insights into Minoan life. The frescoes discovered in locations such as Knossos and Akrotiri inform us of the plant and animal life of the islands of Crete and Thera (Santorini), the common styles of clothing, and the activities the people practiced. For example, men wore kilts and loincloths. Women wore short-sleeve dresses with flounced skirts whose bodices were open to the navel, allowing their breasts to be exposed. Fresco depicting three women: This fresco from the complex at Knossos depicts a popular fashion for Minoan women. Fragments of frescoes found at Knossos provide us with glimpses into Minoan culture and rituals . A fresco found on an upper story of the palace has come to be known as Bull Leaping. The image depicts a bull in flying gallop with one person at his horns, another at his feet, and a third, whose skin color is brown instead of white, inverted in a handstand leaping over the bull. While the different skin color of the figures may differentiate male (dark) and female (light) figures, the similarity of their clothing and body shapes (lean with few curves) suggest that the figures may all be male. The figures participate in an activity known as bull-leaping. The human figures are stylized with narrow waists, broad shoulders, long, slender, muscular legs, and cylindrical arms. Unlike the twisted perspective seen in Egyptian or Ancient Near Eastern works of art, these figures are shown in full profile, an element the adds to the air of liveliness. Bull Leaping : A fresco found on an upper story of the palace at Knossos, Crete, Greece. Circa 1450–1400 BCE. Although the specifics of bull leaping remain a matter of debate, it is commonly interpreted as a ritualistic activity performed in connection with bull worship. In most cases, the leaper would literally grab a bull by his horns, which caused the bull to jerk his neck upwardly. This jerking motion gave the leaper the momentum necessary to perform somersaults and other acrobatic tricks or stunts. Bull Leaping appears to divide these steps between two participants, with a third extending his arms, possibly to catch the leaper. The Minoans settled on other islands besides Crete, including the volcanic, Cycladic island of Thera (present-day Santorini). The volcano on Thera erupted in mid-second millennium BCE and destroyed the Minoan city of Akrotiri. Akrotiri was entombed by pumice and ash and since its rediscovery has been referred to as the Minoan Pompeii. The frescoes on Akrotiri were preserved by the blanketing volcanic ash. The wall paintings found on Thera provide significant information about Minoan life and culture, depicting a highly developed society. A fresco commonly called Flotilla or Akrotiri Ship Procession represents a culture adept at a variety of seafaring occupations. Differences in clothing styles could refer to different ranks and roles in society. Deer, dolphins, and large felines point to a sense of biodiversity among the islands of the Minoan civilization . Flotilla or Akrotiri Ship Procession: This panoramic fresco depicts the Minoans as a highly developed civilization. In one room is a wall painting known as the Landscape with Swallows, or as the Spring Fresco. It depicts a whimsical, hilly landscape with lilies sprouting from the ground . Sparrows, painted in blue, white, and red, swoop around the landscape. The lilies sway gracefully and the hills create an undulating rhythm around the room. The fresco does not depict a naturalistic landscape, but instead depicts an essence of the land and nature, whose liveliness is enhanced through the colors and curvilinear lines. Landscape with Sparrows, or Spring Fresco: Akrotiri, Thera, Greece. c. 1650 BCE. Minoan ceramics and vase painting are uniquely stylized and are similar in artistic style to Minoan wall painting. As with Minoan frescoes, themes from nature and marine life are often depicted on their pottery. Similar earth-tone colors are used, including black, white, brown, red, and blue. Kamares ware, a distinctive type of pottery painted in white, red, and blue over a black backdrop, is created from a fine clay. The paintings depict marine scenes, as well as abstract floral shapes, and they often include abstract lines and shapes, including spirals and waves. These stylized, floral shapes include lilies, palms, papyrus , and leaves that fill the entire surface of the pot with bold designs. The pottery is named for the location where it was first found in the late nineteenth century—a cave sanctuary at Kamares, on Mount Ida. This style of pottery is found throughout the island of Crete as well in a variety of locations on the Mediterranean. Kamares ware vessel: This is a Kamares ware vessel with an abstract floral design. Minoan, circa 2100–1700 BCE. The Marine style emerged during the late Minoan period. As the name suggests, the decorations on these vessels take their cue from the sea. The vessels are almost entirely covered with sea creatures such as dolphins, fish, and octopi, along with seaweed, rock, and sponges. Unlike their Kamares ware predecessors, the light and dark color scheme is inverted: the figures are dark on a light background. Like the landscape frescoes at Thera, these paintings demonstrate a keen understanding and intimate knowledge of the marine environment. In the Marine-style Octopus Vase from the city of Palaikastro, the octopus wraps around the jug, mimicking and accentuating its round shape. The octopus is painted in great detail, from each of its distinct stylized suckers to its bulbous head and the extension of its long tentacles. The surface of this vessel is covered by the main image; bits of seaweed fill the negative space . This filling of the empty space with additional images or designs is another characteristic of Minoan Marine-style pottery. The style is known as horror vacui, which is Latin for fear of empty space. 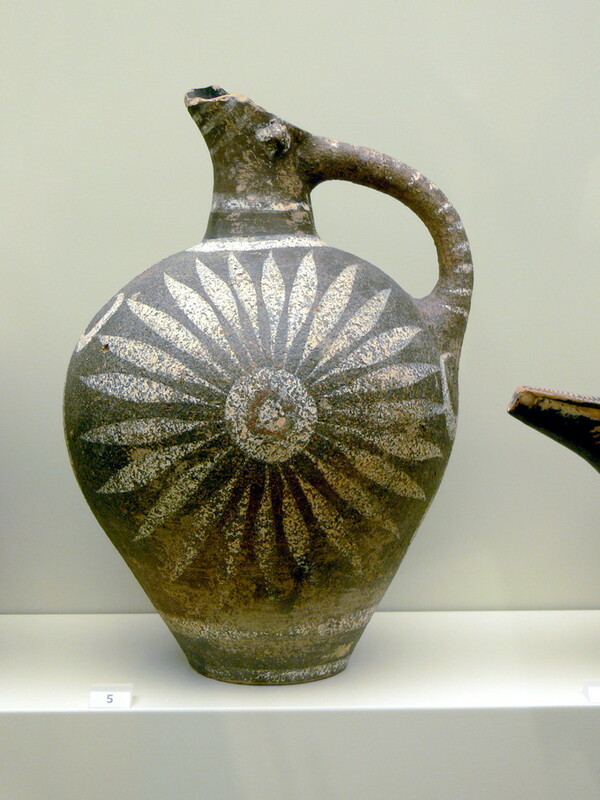 The same aesthetic is seen later, in Greek Geometric pottery. 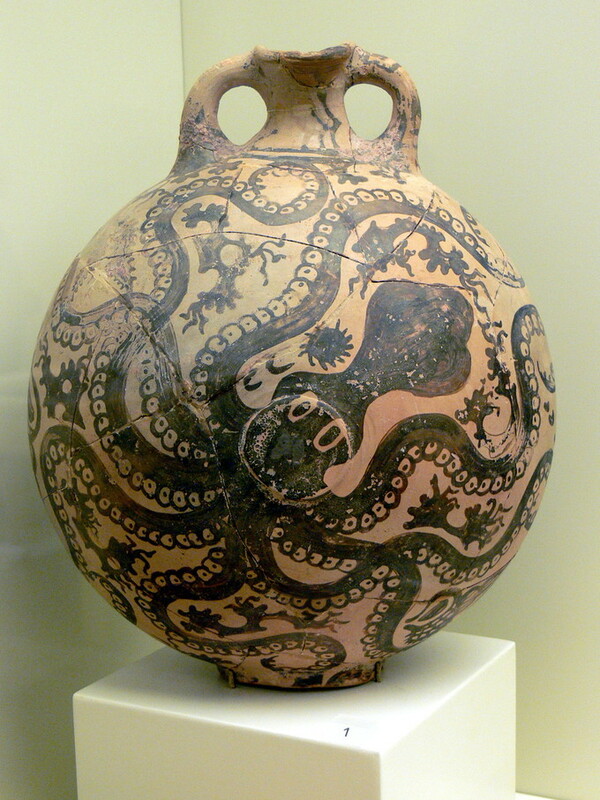 Octopus vase: Octopus vase from Palaikastro, Crete, Greece. Circa 1500 BCE. Minoan sculpture consists of figurines that reflect the culture’s artistic style and important aspects of daily life. Most known Minoan sculptures are small scale. They range from single figures, often frontal, to figure groups that include both people and animals. The wide variety of materials used for these figurines represent the extent of the Minoan trade network throughout the Mediterranean. 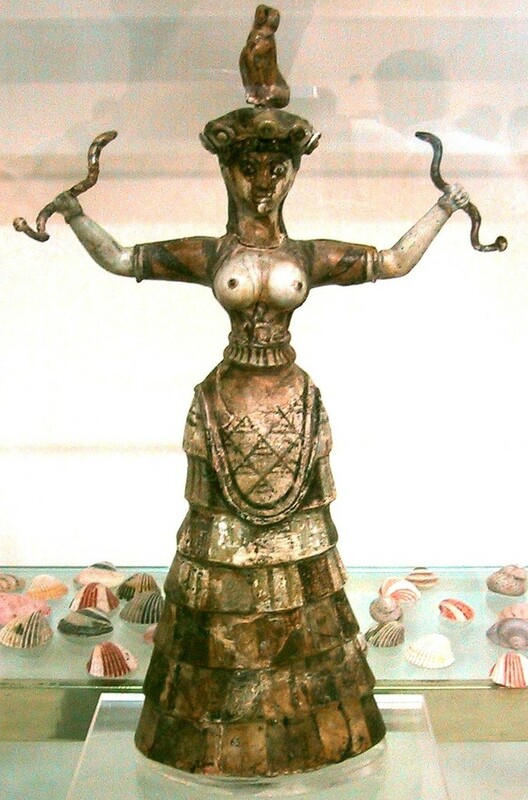 The Snake Goddess statue from Knossos represents an important female figure in Minoan culture . Due to her connection with snakes and felines, as well as her bare breasts, she is perhaps an earth goddess or a Minoan priestess. 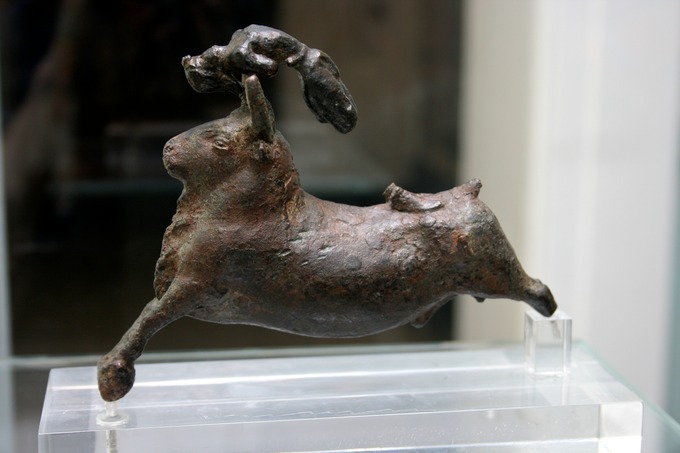 The Bull Leaper demonstrates the Minoan use of bronze in art as well as highlighting the importance of the bull in Minoan sculpture and artistic style . An ivory bull leaper from Knossos demonstrates another position the acrobat’s body assumed during the act. The Palaikastro Kouros is a rare example of a large-scale Minoan sculpture. Its size and rare materials lead experts to believe that it was used as a cult image. lost-wax casting:The most common method of using molten metal to make hollow, one-of-a-kind sculptures. When heat is applied to the clay mold, the wax layer within melts and forms channels, which the artist then fills with molten metal. faience:A low-fired, opaque, quartz ceramic that creates a glass-like material in bright shades of blue, green, white, and brown that originates from Ancient Egypt. chthonic:Dwelling within or under the earth. curvilinear:Having bends; curved; formed by curved lines. As with their painting, Minoan sculpture demonstrates stylistic conventions including curvilinear forms; active, energized scenes; and long-limbed humans with broad shoulders and narrow waists. Women are often depicted in large, long, layered skirts that accentuate their hips. So far, the majority of sculptures and figurines found during Minoan excavations have been small scale. Minoan Woman, c. 1600-1500 BCE. : Bronze. Crete. The small-scale sculptures of the Minoans were produced in many different materials including ivory, gold, faience , and bronze. The variety of materials acknowledges the extensive trade network established by the Minoans. For instance, faience, an quartz ceramic , is an Egyptian material. Its presence in sculpture found on Crete demonstrates that the material was shipped raw from Egypt to Crete, where it was then formed to create Minoan sculpture. 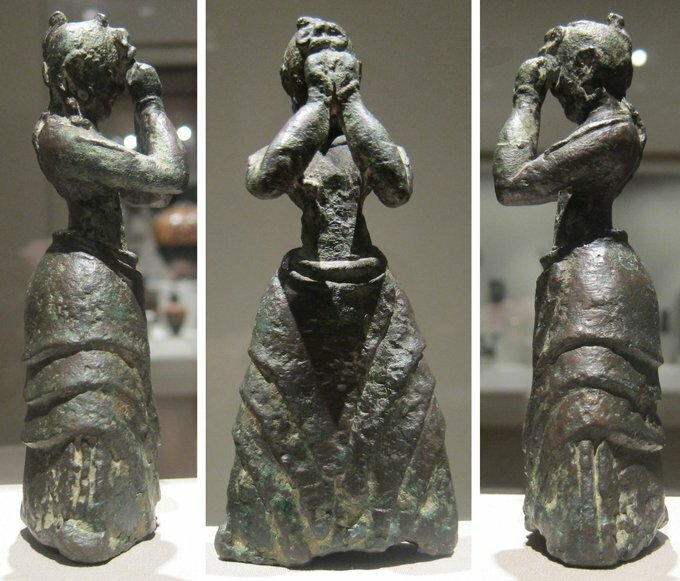 Bronze was an important material in Minoan culture and many figurines were produced in this medium , mostly created using the lost-wax casting technique. One figurine, known as the Snake Goddess , depicts a woman with open arms who holds a snake in each hand, with a feline sitting on her head. The purpose or function of the statue is unknown, although it is believed that she may have been an earth goddess or priestess. The snakes are considered chthonic animals—related to the earth and the ground—and are often symbols of earth deities . Furthermore, the Snake Goddess is dressed in a layered skirt with a tight bodice, covered shoulders, and exposed breasts. The prominence of her breasts may suggest that she is fertility figure. Although her function remains unknown, the figure’s significance to the culture is unquestionable. Snake Goddess, circa 1600 BCE. : Palace at Knossos, Knossos, Crete. Other figures in similar poses and outfits have also been found among Minoan ruins. The Bull Leaper bronze, depicting a bull and an acrobat, was created as a single group. The figures are similar in style and position, as seen in several bull-leaping frescoes , including one from the palatial complex at Knossos. Bull Leaper, circa 1550–1450 BCE. : Bronze. Southwest Crete. The bull stands frozen in a flying gallop, while a leaper appears to be flipping over his back. The acrobat’s feet are planted firmly on the bull’s rump, and the figure bends backwards with its arms planted on the bull’s head, perhaps preparing to launch off of the bull. The two figures, bull and man, mirror each other, as the bull’s back sways in the gallop and the man’s back is arched in a deep back bend. In another sculpture of a bull leaper (c. 1500 BCE), the acrobat is frozen in a forward-facing mid-somersault position. This ivory sculpture from Knossos is the only complete surviving figure from a larger arrangement and is the earliest three-dimensional representation of the bull leap. Experts believe that thin gold wires were used to suspend the figure over a bull. Bull Leaper, circa 1500 BCE. : Sculpted from ivory. Knossos, Greece. The figures are made with curvilinear lines and the positioning of both figures adds a high degree of movement and action that was commonly found in Minoan art. While most known Minoan sculpture is small scale, at least one sculpture serves as an exception to this rule. The so-called Palaikastro Kouros (not to be confused with the stylized male sculptures of ancient Greece), which dates to the Late Minoan period (late fifteenth century BCE), stands at almost 20 inches (50 cm) tall. It is an example of a Chryselephantine sculpture: it consists of a wooden frame, with thin carved slabs of ivory attached to represent the flesh. Sheets of gold leaf likely represent details such as hair and clothing. Its head consists of a semiprecious green stone called serpentine with rock crystal eyes. Because of its scale and the rareness of its media, experts believe the sculpture was a cult image.